Boilers in our homes are key to keeping our houses nice and warm during the colder winter weather and with predictions of icy blasts and snow on the way you want to make sure that your systm is running as smoothly as possible. When looking to have a new boiler or perhaps relocating an existing boiler it is important to use a professional company like greenplanetheating who offer Boiler Installation Forest of Dean. The main reason that you would be looking for a new boiler would be down to the age and condition of your old boiler system and perhaps if you are looking to relocate your existing boiler. The reasons for relocation can included everything from having an extension built on your home, to moving the boiler to a place where it will be less unsightly and where the noise will be less intrusive on family life. The most obvious and common places to have a boiler located in a house include the kitchen and bathroom as well as in utility rooms. In some older properties you often find the boiler located in a purpose-built cabinet in one of the bedrooms. Newer properties tend not to have boilers located in bedrooms but in kitchens and utility rooms instead. The move to condensing boiler and the regulation surrounding these mean that all boilers need to be located on an external wall were the discharge pipe that carries the condensation away from the boiler can be dispersed to outside quickly and easily. Depending on your boiler type you will also have to locate the boiler a certain distance away from any doors and windows. One of the factors that needs to be taken into consideration when installing or relocating a boiler is any works that may be required to move the pipe work. This could include taking up carpets and floorboards before carefully relaying these once the works have been completed. So, this isn’t a project you should undertake after you have spent lots of time and money redecorating or laying down hardwood flooring. It is best to leave this until after the boiler had been installed or moved. If you relocate a boiler you should make sure that you also install a suitable carbon monoxide alarm to detect for any leaks that could be dangerous and potentially life threatening. 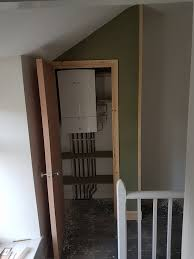 Any good boiler installation company like the one mentioned earlier will make sure that you comply with all building and installation regulations as well as safety measures.